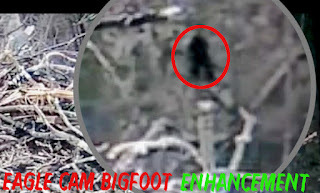 Recently, a video was posted to youtube of a possible bigfoot walking in the forest. The camera that caught it was one of those that is trained on an eagle's nest. It seems the camera, that is mounted in a tree or something, has caught a dark figure moving in the forest down below. 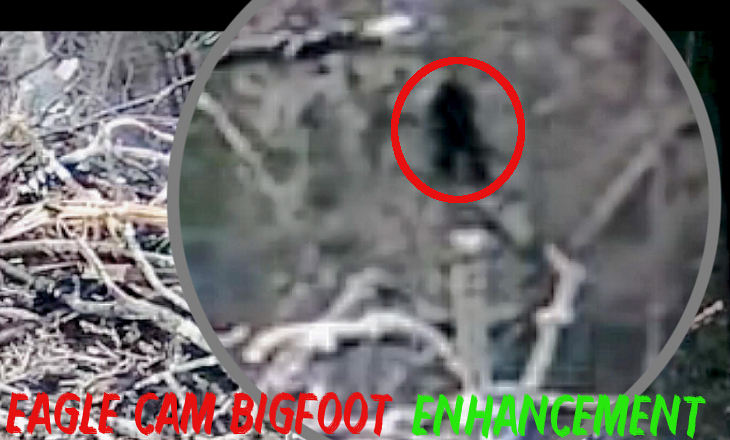 The figure is seen walking along a down tree and then making a small jump before moving off camera. The video has been around for several month, but it seems to be gaining attention. Some have speculated that this was a bear walking on two feet and then going back down on all fours. But in our enhancement, it is very clear this is not a bear. Here is my enhancement and opinion about the unknown figure. 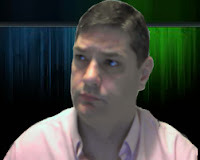 It is a cool capture and it makes me wonder if other cameras have also captured unknown figures. It seems almost every town has these cameras that monitor traffic, it only stand to chance that one somewhere has captured a possible bigfoot.